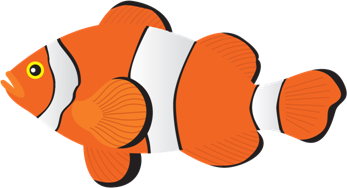 Clownfish are orange with white patches and can grow up to 18 centimetres long. They are found near coral reefs in the Indian and Pacific oceans. Often clownfish live near poisonous plants called sea anemone but they are coated in a type of mucus to protect them.